Clean Genie are able to provide a comprehensive Washroom Design, Installation and Equipment Rental Service. From initial consultation we can design, source, install, service, empty and clear everything from Sanitary & Nappy Disposal Bins to Hand Soaps and Dryers. Nearly all washroom and hygiene products are available on a low annual rental which means you save valuable time and money, allowing you to concentrate on your business. A totally professional & discreet service. Regular & Flexible servicing to suit your requirements. Fully compliant with the Environmental Protection Act 1990. A modern slim unit available with or without an operational pedal. Clean Genie Environmental offer a range of Vending Machines which are attractive and modern in design. These are available to buy or on a service/rental basis. Totally professional and discreet servicing. Regular and flexible to suit your requirements. An essential item in any parent and baby facility. 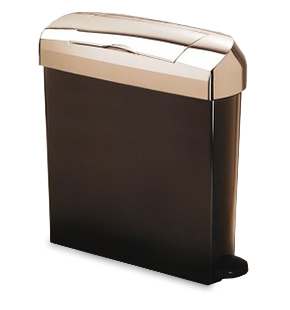 A strong, safe, comfortable unit which folds flat to the washroom wall. A programmable wall mounted system that is both stylish and functional teamed with a unique chemical formulation designed to attack major problem areas. Clean Genie can supply a wide range of soap systems, on a supply only or a regular service basis. Compliant with Relevant Hygiene requirements. Automatic Odour Control Systems. Creating fresh, clean and hygienic washroom environment. Supplied and serviced on a regular basis to suit your requirements. Clean Genie offer a wide range of dryers, that are modern and stylish in design. The choice available ensures you receive the correct system for your washroom requirements. Available to buy or on a rental basis. Clean Genie can supply a broad spectrum of products to meet the requirements of your washroom consumables, from cleaning products to paper towels.